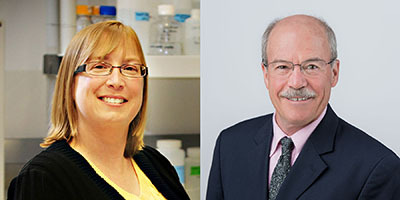 University of Utah professors Shelley Minteer and Glenn Prestwich are among the 416 newly-elected Fellows of the American Association for the Advancement of Science (AAAS). Election as a Fellow is an honor bestowed upon AAAS members by their peers. AAAS members have been awarded this honor because of their scientifically or socially distinguished efforts to advance science or its applications. Minteer and Prestwich join 126 other Fellows either currently or formerly affiliated with the U, including Nobel laureate Mario Capecchi and Senior Vice President for Academic Affairs Dan Reed. The U’s first Fellow was geologist and former university president James Talmage, elected in 1906. New Fellows will be presented with a gold and blue (representing science and engineering, respectively) rosette pin on Saturday, February 16, 2019 during the 2019 AAAS Annual Meeting in Washington, D.C. Fellows will also be announced in the AAAS News & Notes section of the journal Science on November 29, 2018. Minteer’s career has focused on using nature as an inspiration and solution to chemistry problems. Her work has resulted in 17 issued patents and over 300 peer-reviewed publications in using biology as inspiration for biosensing, energy storage, energy conversion, and electrosynthesis. “As we start to think about renewable energy sources, whether that’s solar or wind, we need to think about how we store that energy for when the sun doesn’t shine and the wind doesn’t blow,” she says. Her research group focuses on nature-inspired catalytic cascades of reactions that store energy in chemical bonds. “If you look at biological systems, biology does energy conversion extremely efficiently, so we are using that energy conversion machinery to improve the efficiency of electrochemical energy conversion devices” she says. Minteer feels honored by her election as a AAAS fellow, the latest in a long line of chemists from the U. For almost 50 years, Prestwich’s career has been about encountering problems in biology and medicine and innovating solutions to them with chemistry. His work has resulted in over 40 issued patents, 650 peer-reviewed papers, commercialization of research tools for drug discovery in cancer, and the development of biomaterials for cell therapy, wound healing and the prevention of post-surgical adhesions. “The perspective that I bring is that of an organic chemist who helps biologists and physicians solve problems in research and clinical care,” says Prestwich, an emeritus presidential professor of Medicinal Chemistry. Prestwich has been one of the University of Utah’s most successful and prolific entrepreneurs. Along with mentoring over 150 graduate students, post-doctoral scientists, and visiting faculty, Prestwich identifies “a seminal moment” in his outstanding career as creating and directing the first entrepreneurial faculty scholar program at a U.S. university. Founded in 2007, this unique group at the University of Utah promotes collaboration across disciplines, the translation of academic discoveries into products that improve people’s lives, and the mentoring of faculty and student entrepreneurs. The tradition of AAAS Fellows began in 1874. Currently, members can be considered for the rank of Fellow if nominated by the steering groups of the Association’s 24 sections, or by any three Fellows who are current AAAS members (so long as two of the three sponsors are not affiliated with the nominee’s institution), or by the AAAS chief executive officer. Fellows must have been continuous members of AAAS for four years by the end of the calendar year in which they are elected. AAAS Fellow’s lifetime honor comes with an expectation that recipients maintain the highest standards of professional ethics and scientific integrity.